Cancer wellness IS possible. Cancer is a life changing event that affects the entire family. Treatment decisions, relationship changes, body changes, the roller coaster of emotions.....all of this takes its toll on families. Finding a therapist who has been specifically trained and credentialed in this type of support is crucial during this time. I became a Board Certified Oncology Social Worker earlier in my career and now work 24 hours weekly as a cancer call center counselor. I stay current in research and treatment, cancer resources, as well as the special issues of cancer survivorship. When appropriate, I utilize Mindfulness Based Cancer Recovery techniques that have been proven to lessen the emotional and physical impact of cancer on the patient and on the caregiver. I was the Clinical Director of the St. Louis Affiliate of the Cancer Support Community for 5 years and served on their BOD for 2 years. During this time I trained with the Live Strong Foundation in Texas and the American Cancer Society as an I Can Cope support group facilitator. I currently serve on several local cancer committees providing direction in cancer programming as a volunteer. As a 2 decade personal survivor, and after supporting my husband through bladder cancer, I have a unique perspective on the needs of patients and their families. 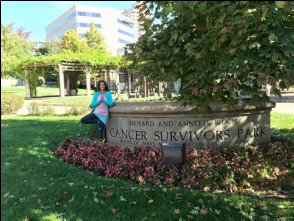 As a Yoga 4 Cancer Trained Teacher I am happy to incorporate Yoga4Cancer ideas into your treatment plan. www.cancersupportcommunity.org/MainMenu/About-Cancer/. To listen to an interview with Cancer Support Community CEO and myself regarding the services of the cancer support call line.